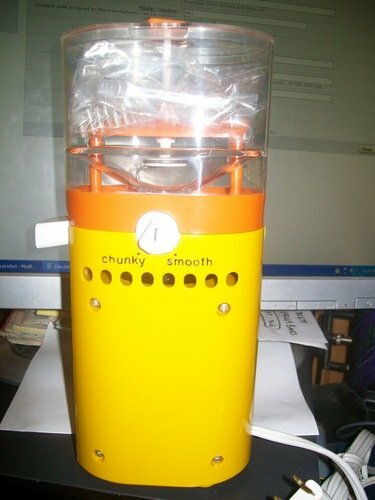 It’s not available anymore, but check out this 1970’s Salton Peanut Butter Maker that was up for sale on Amazon. Dig that orange and yellow palette! I can almost taste the 70s on my palate. They probably used to make so many of these things that they had to ship them on a pallet. Wouldn’t you agree, pals? It would be pretty hard to hunt down one of these vintage peanut butter makers again, so in the meantime, here is a new one: Nostalgia Electrics NBM400 Electric Peanut Butter Maker . Not colorful nor highly rated, it won’t evoke the same memories, but hey, it’s less than $30. Just imagine how many bags of peanuts that could buy in 1970! Where can I purchase this machine? It’s the same one I had years ago when I made my own peanut butter. I really loved it. I don’t know what happened to it. Hopefully, the link above will hold you over to the real thing can be found again. It is a pretty cool looking machine. And by cool, I mean bright yellow and orange. Happy hunting!